These gardens are set across the road from the Victoria Arts Centre, including the National Gallery of Victoria. 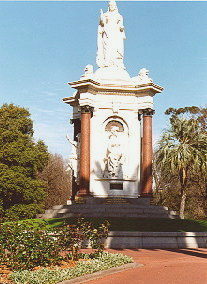 Features of the gardens include Melbourne's floral clock presented to the city by the watchmakers of Switzerland. 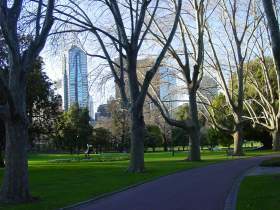 The Queen Victoria Gardens are part of a group of gardens lying between the Yarra River and St Kilda Road. For more photographs, see our 2005 visit to Queen Victoria Gardens. Getting there: Getting there by public transport: From Flinders St take southbound tram except 1 or 2 to stop 18 or walk over Princes Gate.